Special Containment Procedures: SCP-2967 and SCP-2967-1 are to be contained in a 5.5 meter cubical reinforced glass tank, with water containing 3.5% salinity (seawater), kept at roughly 8 °C at all times. This tank is to be cleaned at least twice per week, at which point SCP-2967 and SCP-2967-1 will be relocated briefly to an observation tank. The top of SCP-2967's containment tank is to remain closed at all times, with the exception of cleaning and feeding. SCP-2967 and the six SCP-2967-1 are to be each fed two live clams, whelks, or small fish daily. When interacting with SCP-2967, prawns or small crabs are acceptable for use as incentive for a response. SCP-2967 and SCP-2967-1 are allowed a number of 'toys' to keep occupied in primary containment, such as building blocks, plastic fish (though too large to be edible), and a small magnetic slate with a stylus attached. For testing and routine intelligence checks, SCP-2967 is to be relocated to the observation tank in the room adjacent to its containment chamber. Unsupervised communication with SCP-2967 is currently prohibited. Description: SCP-2967 is an abnormally large specimen of Octopus vulgaris.1 SCP-2967 is roughly 33cm in mantle length, with its arms stretching up to roughly 1.5m long. SCP-2967 has demonstrated behaviors common to multiple species of octopus, even those it could not have conceivably come into contact with, such as mimicry of specific animal traits and features, and use of tools as camouflage and shelter. In addition, SCP-2967 has shown unique traits, such as mimicry of human symbols ability to communicate through written language, recognition of colors, symbols, and individual features of other species, and an abnormally high intellect. Since being recovered at ██████ Aquarium in ███████, Mississippi, SCP-2967 has demonstrated rapidly rising levels of intelligence, which are currently comparable to dog chimpanzee human levels. SCP-2967 was able to easily pass a simple animal IQ test involving association between certain symbols and food in a record number of trials when first obtained, and has scored up to 117 in a human intelligence quotient test as of ██/██/████. SCP-2967 has demonstrated willingness and ability to communicate with Foundation staff on multiple occasions through crude sign language, and more recently, written language, through use of a waterproof magnetic slate with an attached stylus. At time of writing, SCP-2967 has learned to write and comprehend basic English, Spanish, and French by observing researchers outside of its tank. This development has allowed researchers to facilitate contact with SCP-2967 through use of a whiteboard placed roughly a meter from the tank, with SCP-2967 responding by use of a magnetic slate. SCP-2967 is sociable and appears to enjoy interacting with staff, displaying such behaviors as making rough sketches of itself, SCP-2967-1, and staff members, and on one occasion attempting to play 'tic-tac-toe' with research staff. In conversation, it refers to itself as 'Levi', which is the name it was given by staff members at ██████ Aquarium after being discovered. SCP-2967-1 collectively refers to six Octopus vulgaris that also exhibit behaviors similar to SCP-2967. However, SCP-2967-1 are of average size, and have not demonstrated the same rate or capacity for learning that SCP-2967 has. SCP-2967-1 appear to treat SCP-2967 as a leader, and will defer to it in nearly all situations. SCP-2967 refers to SCP-2967-1 as its 'students', 'children', 'friends', and more recently, its 'army'. SCP-2967-1 are currently unable or unwilling to communicate with research staff, although SCP-2967 has been observed 'teaching' using its magnetic slate multiple times. When isolated from SCP-2967, SCP-2967-1 quickly lose cohesiveness as a group, becoming irritable, and crowding around the area where SCP-2967 was last located. SCP-2967-1 have also been observed attempting to breach containment while in this state, most likely to attempt reunite with SCP-2967. When SCP-2967 is reintroduced into containment, normal behavior resumes. SCP-2967 claims this is due to it being a 'positive influence'. SCP-2967 was recovered after Agent ██████ received a report of an octopus that had caused a blockage in the filtration system of a nearby tank, causing the crabs that inhabited it to be removed for cleaning and kept in a separate room temporarily. SCP-2967 then proceeded to escape its tank, climb its way into the room, and consume numerous crabs. Agent ██████, posing as an animal behavior specialist, isolated SCP-2967, and was able to confirm its abnormally high intellect, as well as its ability to respond to rudimentary sign language. Aquarium staff were not aware of SCP-2967's presence prior to the initial incident, leading research staff to believe SCP-2967 may have been accidentally transported to ██████ Aquarium with a shipment of feed fish. 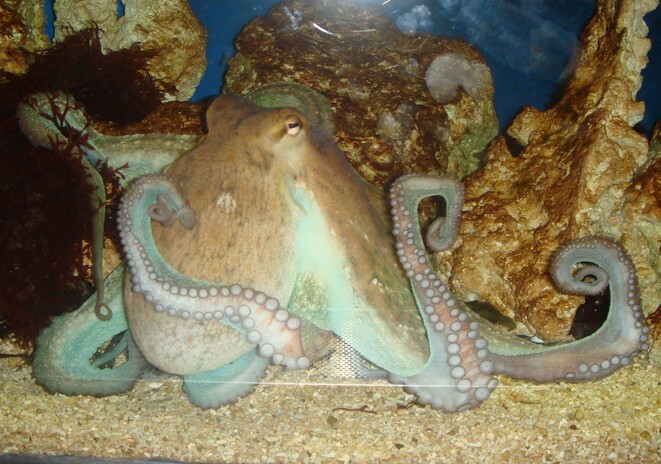 Shortly after containment of SCP-2967, Agent ██████ was again contacted by Aquarium staff, requesting his assistance in dealing with multiple octopuses that had begun to frequently become hostile, escape their tank, and arrange pebbles on the floor of their tank depicting the image of an octopus. This led to the containment of all six instances of SCP-2967-1. Involved Aquarium staff were administered class A amnestics. Addendum 01: On ██/██/████, SCP-2967 was engaging in a written conversation with Dr. Reynard during a routine intelligence test, during which it referred to another potential anomaly that may have some connection to SCP-2967, which it refers to as 'Crow'. The log of the interview is contained below. SCP-2967 has since avoided questioning regarding 'Crow', as well as questions about its meaning regarding 'to be [the] next you'. SCP-2967-1 have also been more reluctant to allow SCP-2967 to be taken to the observation tank for testing, and have displayed wariness of research staff. As of writing, SCP-2967 has been reclassified to Euclid. Foreword: The following is a portion of a routine intelligence check performed every two weeks to acquire more information on SCP-2967's rate of intellectual progress, as well as its means of doing so. For brevity, this segment has been cut down to the portion in which SCP-2967 made reference to another possible anomaly sharing its traits, as well as its possible disclosure of some sort of motive. Please note all responses were over writing unless otherwise specified. Dr. Reynard: You like (Dr. Reynard draws a rough sketch of a crab and an octopus, alongside a rough sketch of one of SCP-2967's fish shaped toys.) CRAB and FRIEND and TOY. SCP-2967: That ! Word ? SCP-2967: (SCP-2967 draws a heart with an X across it.) DONT LIKE CROW ! Dr. Reynard: Levi (SCP-2967's preferred name for itself) and Crow fight? At this point, SCP-2967 was cleared to return to its primary containment chamber, where it was reported to remain secluded inside its hollow log shelter for roughly a day before slowly resuming normal behavioral patterns. During this time, SCP-2967-1 were observed to cluster around SCP-2967 in a defensive position. Researchers also noted that SCP-2967 was noticeably more timid than usual in approaching the surface of its tank during feeding time, and discharged ink before retreating to its shelter after Dr. Reynard entered the room to retrieve notes from the previous day. Due to this unexplained change in behavior, stricter containment procedures are being considered. Addendum 02: On ██/██/████, research staff reported a high concentration of American Crows surrounding Site-██, where SCP-2967 is contained. These crows displayed no aggressive behavior towards Site staff, and repeatedly flew over the area of the building where SCP-2967 is contained, stopping multiple times to peck at a nearby window. After MTF Lambda-4 ("Birdwatchers") were called in to investigate the situation, all but one of the crows dispersed. The remaining crow, which was noted by research staff to be abnormally large, deposited the decaying remains of one Octopus vulgaris, roughly ten meters from the site, before retreating. Attempts to follow the group of crows were met with failure, however MTF Lambda-4 was able to discover an area in a nearby forest that contained an abnormally large number of feathers belonging to the American Crow, as well as numerous small, makeshift huts, and a collection of various litter fashioned into basic tools. Also retrieved were the torn remains of a copy of the documentation for SCP-2967, kept in the largest hut. This area is currently being monitored, and a standard avian containment chamber has been prepared in the event that the abnormally large crow, deemed SCP-2967-B, is captured. SCP-2967 is currently unaware of the incident. 1. Also known as the common octopus.